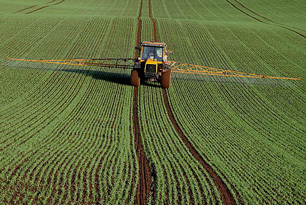 Chlorotoluron is an herbicide used to control grasses and broad-leafed weeds on winter barley and wheat crops. It is not currently manufactured or registered for use in the United States. Chlorotoluron degrades slowly and is somewhat mobile in soil. When it arrives in water through agricultural runoff, it can remain there for several months. Exposure through drinking water may occur in countries where it is used, and the World Health Organization reports that it has been detected in both surface and ground waters in the United Kingdom and Germany. There are so far no reported incidences of human poisoning, but animal studies have shown that chlorotoluron is of low acute toxicity. Long term exposure to large amounts has been shown to cause tumors in the kidneys of male mice, although these results did not occur in female mice or rats. According to the World Health Organization, chlorotoluron should be treatable with granular activated carbon.